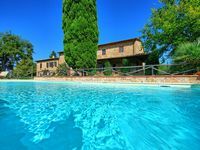 In the heart of Tuscany near Florence "Iris"
Property 52: In the heart of Tuscany near Florence "Iris"
Villa Alvise: A charming two-story villa located on top of a small hill, with Free WI-FI. Property 56: Villa Alvise: A charming two-story villa located on top of a small hill, with Free WI-FI. Villa Collarina: An elegant and welcoming villa situated in a quiet location, surrounded by a wonderful garden, with Free WI-FI. Property 77: Villa Collarina: An elegant and welcoming villa situated in a quiet location, surrounded by a wonderful garden, with Free WI-FI. Villa Begonia Grande: A charming two-story apartment that is part of a villa located on top of a small hill, with Free WI-FI. Property 79: Villa Begonia Grande: A charming two-story apartment that is part of a villa located on top of a small hill, with Free WI-FI. Overall: Enjoyed every minute!!! Enjoyed Most: We thoroughly enjoyed the kitchen. We had a fantastic cooking class for 10 and had plenty of room. A perfect gathering place for all of us.. Enjoyed Least: I can't think of a thing! Surrounding Area: Easy to get to town for marketing and pastries. Nearby Events or Locales: Empoli. Yes but quite a walk... Tips or Restaurants: Bring ac adapters! Coop supermercato in Empoli has EVERYTHING you will need from groceries to electronics. If you are driving I would recommend GPS assistance for directions. Directions: We hired drivers so this was no problem. Check In Out: It was very easy. fabulous all around, the venue, scenery, hospitality. Excellent!